December 1, 2017 | 3:30 p.m.
Randy Dorn '77 flashes his phone with a smile, showcasing a photo of his two young granddaughters decked out in Bethel gear at this year's Homecoming festivities. "Here, look-we have two future Bethel students," he says. 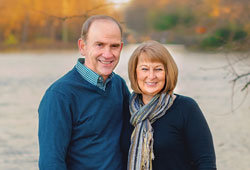 Dorn, a member of the Bethel University Board of Trustees , and his wife, Gail, have built a family largely thanks to connections made in the Bethel community. For this reason-regardless of where their five grandkids choose to go to college over 10 years down the road-the two have committed to supporting Bethel's mission. Dorn came to Bethel as a transfer student from Chicago, connected to the school through his upbringing in a Baptist General Conference (now Converge) church. "Growing up, Bethel was always talked about at church as, 'If you're going to go to a Christian college, you're going to Bethel. That's where you need to be,'" he says. But soon after enrolling, Dorn developed a more personal relationship with the school. "The teachers knew you," he says. "They cared about you, and they cared not only about your educational development but your spiritual development, as well." The experience stood in stark contrast to Dorn being "one of 300 in a classroom" at his previous school. Through Bethel connections, Dorn was also set up on a blind date with his now wife, Gail. The two established friendships in the community that continue to this day. So, when Dorn's son, Ryan '04, and daughter, Courtney (Dorn) Bonstrom '05 began looking at colleges, Bethel was a natural fit. From the start, both had a positive experience that mirrored their father's-and they both made connections that expanded their family. Gail recalls a particularly special memory from the Chapel service during Courtney's Welcome Week. After the service, parents had the opportunity to pray for their children and for other students whose parents weren't in attendance. "When the prayer time came, I went [to pray] for this really nice young man," she says. "And he turned out to be our future son-in-law!" Ryan, too, met his wife at Bethel. But Bethel has impacted the family outside of bringing them all together-it made a tangible emotional, spiritual, and professional difference that has inspired the Dorns to give back. "We're very passionate about Bethel, having seen the impact [the school] has had on our lives and the lives of our children and their spouses," Dorn says. "We want to see that continue for other students-for them to have the same positive experience from the educational and the spiritual growth standpoint that we had." To help make that happen, the Dorns have actively given their time and finances to Bethel for years. As a member of the Board of Trustees, Dorn also serves as chairman of Bethel's Finance and Audit Committees, working closely with Chief Financial Officer Pat Brooke to review and audit Bethel's finances. "He is a big-time player in a big business, and to bring that kind of background and experience into the finance audit area is very good for us," Brooke says. "And yet…he is this humble guy who says, 'I'm just trying to learn,' but we're learning from him." Dorn-now the central region president of Allied Universal Security Service-attributes much of his and his family's professional success to lessons learned at Bethel. "I think the quality of education at Bethel is absolutely outstanding," Dorn says. "It set [us all] on great career paths." Dorn has been working in the business field from the start of his career, and he says his Bethel class, Patterns of Christian Thought, helped him hold strong to his faith and personal integrity in his day-to-day work. His father also inspired him professionally and spiritually when they worked together early in Dorn's career. "I got to see [him] live his Christian testimony, and see the values come alive [in a business setting]," Dorn says. Dorn steadily advanced from working alongside his father in a sales role to become the president of Initial Security, which prompted a move to San Antonio, Texas. Shortly after that move, Initial Security was acquired by Allied Universal. Thankfully, the change didn't require the Dorns to move again. Instead, they received unexpected proceeds from the turnover. This prosperity served as the precipice for them to begin making larger donations to the ministries they were passionate about, and Bethel was at the top of their list. The Dorns established a Donor Advised Fund through Bethel at the recommendation of Senior Development Officer John Neibergall. Donor Advised Funds involve a gift of $10,000 or greater, giving donors tax benefits and the ability to distribute funds to any ministry over a desired period of time. The funds are managed and invested by the Bethel Foundation. Bethel recommends these funds because they provide similar benefits to a private family foundation with fewer taxes and fees. "We gave to Bethel anyway, so the fact that there's no cost associated with [the fund] as long as we give a percentage to Bethel when we give our disbursements makes it really fit with what we had in mind," Gail says. The Dorns appreciate the autonomy of the fund, and that they have the opportunity to add to it and "continue [giving to] the ministries we're passionate about-Bethel being one of them." When Dorn flips open his phone again to show "three more future Bethel students," it's clear why he hopes this joke will become a reality. "We've come to realize how important it is for young people to have a Christian worldview," Gail says. "They're so bombarded by a secular view in every aspect of their life…they need encouragement." Learn more about Donor Advised Funds and how you can advance Bethel's mission.